Tony was born in Leicester in 1934. He has always drawn and painted since his school days, entering his first art competition whilst at the Gateway Boys School. His first employment was as a sculptor and studio hand with J. E. Slater of Kibworth, then on to serve an apprenticeship in Display and Commercial Art with Key Displays in Leicester. Tony attended classes at Leicester College of Art and Cambridge Art School, exhibiting in the Leicester Sketch Club and The Leicester Society of Artists annual exhibitions. 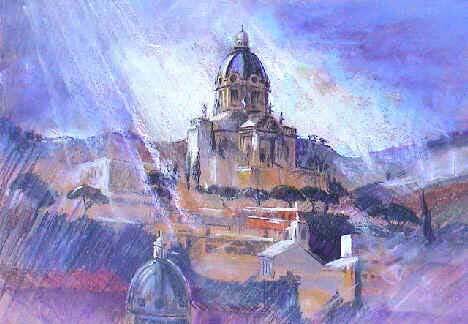 His mentors were J. S. [Stan), Read a keen "atmospheric" watercolorist, and the late James [Jim] Kibart. Eventually he became self-employed and formed Antone Display Studios, Antone Displays Ltd and Enterprise Graphics Ltd. After he retired in 1989, Tony carried on teaching art to adults and this has become a serious hobby, not only teaching in France but also on Cruise Liners, travelling half way round the World.